Looking for beautiful Christmas trees near Middlesbrough? Your search ends here because, at Whitegates Nursery, we have an enviable collection of naturally grown Christmas trees to fill your home and holiday season with young, green joy. Hallelujah! Blue Spruce: The prickly needles on this beautiful spruce carry a silver-blue hue that keeps you guessing what colour it really is. This natural Christmas tree looks stunning due to the lasting stiffness of its needles and a good display of symmetry. 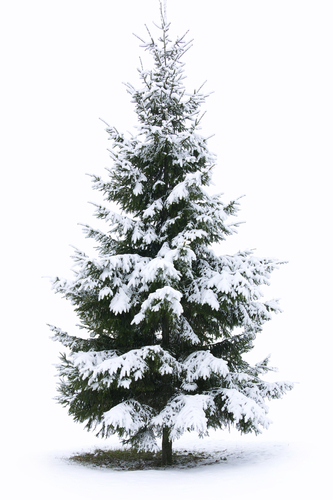 Douglas Fir: The Douglas Fir Christmas tree comes with a blue-green shade to its needles. While the green is overwhelming, you will clearly feel the blue in dim lighting. It keeps its needles for weeks and expels a mild, sweet scent. Fraser Fir: With a narrow base, this fir makes the ideal choice in our displays of Christmas trees near Middlesbrough because homeowners can keep it indoors without worrying about space. It has a solid green hue and retains its needles for quite a while. Noble Fir: For those who prefer the green in their Xmas tree complemented with a dull hue, this is the best choice. The grey-green of the needles in a Noble Fir make it stunning yet not shocking to the eye. It also keeps its needles for the longest among all other types and is thus the priciest. Nordmann Fir: One of the favourite naturally grown Christmas trees in Britain, this fir sells the most now. The reason for this growing popularity is its retention of the needles for weeks. The soft needles will not prick your curious children and its symmetrical look makes it look like the Xmas tree out of an animated film. Norway Spruce: Probably a favourite of us Brits, Norway Spruce comes with a vivid green in its needles and carries a sweet fragrance. However, since it loses its needles rather fast if you are coming over to Whitegates Nursery for one of these, do not make the trip until mid-December. Nothing makes your Christmas decorations shine like a beautiful fresh-cut Christmas tree as the centre of focus in the house. At Whitegates Nursery, the Xmas trees we sell are mostly grown in our premises through the year. When we need to purchase more to satisfy our customers, we make sure they are naturally-grown, fresh-cut Christmas trees. We have a few trusted growers we go to when we get close to Christmas and demand increases. Our display of Christmas trees near Middlesbrough is sure to amaze you. With the kind of variety we offer when you come out looking for the Xmas tree you and the family would love, you will see no need to visit any other facility for fresh-cut Christmas trees after visiting us. We welcome you throughout the year as, besides Christmas trees, we stock a wide range of homegrown plants as well as we serve delicious tea and cake in our tearoom. During your visit, you can get expert suggestions from our team, picking out real Christmas trees. Our sales team is made up of people who actually love gardening themselves and know a great deal about our inventories, the hobby of gardening, and preserving plants. They will provide you priceless advice about which ones in our display of real Christmas trees near Middlesbrough will suit you best, based on your budget and decoration space back home. Talk to the experts freely and tell them your wishes for the kind of real Christmas tree you would want for the holidays and they will point you in the right direction. Interestingly, driving to Whitegates Nursery from Middlesbrough is actually quite a simple exercise. The less-than-14-miles of road between you and our premises can be covered in less than 20 minutes in decent traffic if you take the A19 going south. Visit us in late November and browse through our display of natural Christmas trees for the one you absolutely love to take home for the holidays.